At full speed the fans can hit 1,800 RPM, which is fairly restrained compared to others we've tested recently, many of which reach well over 2,000 RPM. This showed in the noise levels, with the cooler reaching audible levels but well within tolerable limits, and the pump was quiet too. This didn't stop it outperforming every other 240mm cooler except for Corsair's monstrous H100i Pro RGB in the LGA 1151 system, where it obtained a delta T of 44°C. 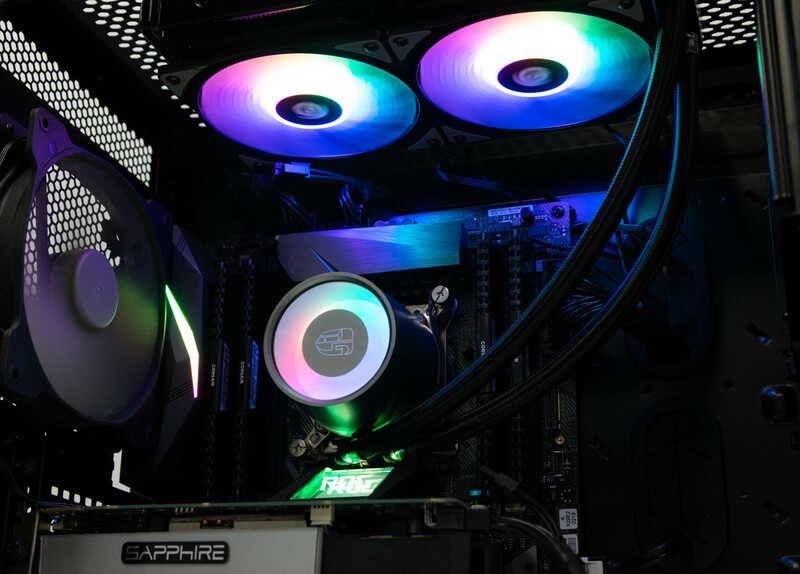 It was a similar story in our LGA 2066 system, where it matched the Cooler Master MasterLiquid ML240R RGB at a delta T of 68°C, which saw temperatures top 90°C when dealing with our overclocked Core i9-7980XE. Again, Corsair's H100i Pro with its 2,400 RPM fans was able to dip down to just 60°C here at full speed, admittedly with a lot more noise. Our AM4 system saw less variation in the best and worst results, but this was one system where the Castle 240 RGB slipped, but only by 1°C against the MasterLiquid ML240R RGB with a delta T of 51°C, so there's next to nothing on AM4 between Deepcool's effort and other 240mm AIO coolers we've tested bar the Corsair H100i Pro RGB, which managed a delta T of 45°C at full speed.